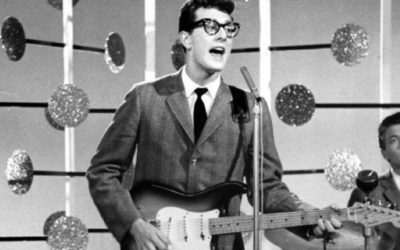 On this day in 1959, Buddy Holly was buried in Lubbock, Texas. His tombstone reads “Holley”, the correct spelling of his given surname and includes pictures of a guitar. On Feb 3rd 1959, after a show in Clear Lake, Iowa, Holly chartered an airplane to travel to his next show in Moorhead, Minnesota. Soon after takeoff, the plane crashed, killing Holly, Ritchie Valens, the Big Bopper and the pilot, an infamous milestone in rock history known as The Day the Music Died.